Love it or hate it, you can't ignore Windows Vista. Fans of Apple's Mac OS X will tell you that all of the good bits of Vista have been blagged from the Tribe of Jobs but the fact remains that the vast majority of us use Windows XP so the question is simple, why the hell should we make the switch from Windows XP to Windows Vista? We've got ten solid reasons why you should. By default, Windows XP is open to the world. Every user has complete control over the guts of Windows and you only have to open a dodgy web page to find that your PC is infected with malware. Microsoft, Symantec, ZoneAlarm and other security vendors have their work cut out plugging the various holes, but Vista changes all that. This time access is locked down tightly from the start, and while it can get annoying, the User Account Control feature will prevent software from running or making any changes unless you give it specific permission to do so. It's easy to suffer from UAC fatigue where you authorise every pop-up without reading it properly, but despite that it's clear that Microsoft has taken a major step in the right direction. A new version of Windows wouldn't be complete without a major serving of eye candy, and Aero is that sugary delight. Aero uses graphics hardware to add translucent borders to your windows, which is nice, while Aero Flip stands all of your open windows up in an angled line and lets you quickly scroll through them to the one you want, using your wheel mouse. The third part of Aero is the taskbar. As you roll the pointer over the minimised icons on the taskbar, thumbnails of the contents of each window pop up in order that you can track down the window that you're after, quickly and easily. Perhaps Windows Vienna should be called 'Tiles' rather than 'Windows' when it's released in 2011. 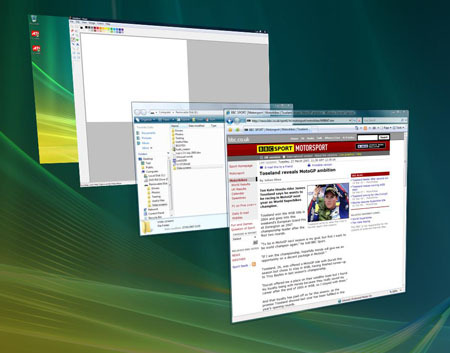 Just like every version of Windows in history, Vista includes a number of bundled applications. Windows Movie Maker 6 has a smart new interface and, more importantly, it supports the new HDV high-def video format. On the games front, you get tarted up versions of FreeCell and Minesweeper and in addition there's Chess Titans and Mahjong Titans. They're both good games that look smart and play impressively well - I struggle to beat Chess on level three. Out of nine. Xbox Live, the multiplayer gaming system, has been expanded to include Windows Vista so you can join in the on-line fun and frag your friends. That's right, it's one great big happy Microsoft gaming family. Get ready for some cross-platform Halo 2 multiplayer action. 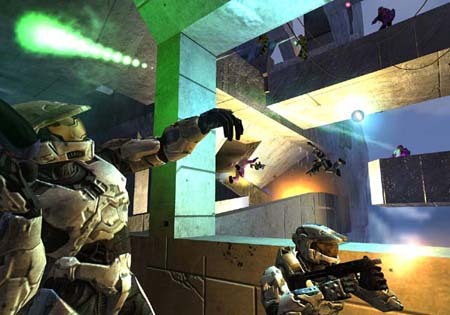 Halo was an enormously successful game when it finally shipped for the PC, and Halo 2 sold by the truckload in its Xbox 360 incarnation. It's coming to the PC too, but you won't be able to play it on your Windows XP PC when it is released on 18 May because it will only run with Windows Vista. Other developers may be unwilling to ignore all the Vista refuseniks out there but the Halo series is published by Microsoft and it's using the game as a great big stick to steer not only its own customers but hopefully all those pesky Play Station 3 and Nintendo Wii reprobates. If you expect anything to change with Halo 3 you've got another thing coming. PC users had better get used to the fact that Halo = Vista.